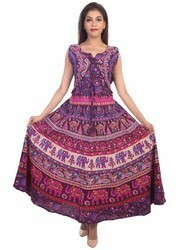 We are a leading Manufacturer & Exporter of Midi Dress.We use Cotton,Rayon,Cambric Cotton 60x60. All Check before dispath and Export Stitching. 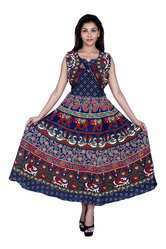 Our Organization is highly specialized in offering a wide array of Jaipuri Cotton Dresses to the clients. Well qualified professionals craft and design the offered products by utilizing latest technology and finest grade quality fabric. The offered assortments of products are widely demanded for their softness, longevity and shrink resistance. Our qualitative products are available in a wide range of patterns, colors and sizes. We offer these products at nominal market prices.Being a well established-organization,we are engaged in offering.. These Jaipuri Cotton Dresses are checked at our end before dispatching to customers in order to guarantee its quality.